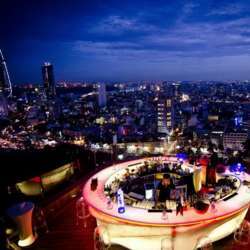 For the second Official Event in April, we would like to bring you back the absolute favorite sky bar in HCMC, the Chill Skybar, which is the most amazing rooftop bar surrounded by the sparkling lights of Saigon. What is even better, we will have private space with the stunning view seen in photos attached to this event post. Music will not be too loud for our group. This will be a night to remember! Every guest will receive one free welcome drink to enjoy (wine, beer, sparkling or soft drink), and the venue will also provide snacks and some canapés (nuts / chips / assorted rice paper rolls). Your second drink starts from 120k++ (beer, house wine, soft drinks). This is also a great chance to dress up to the occasion, so please show us your most elegant outfit! Feel free to bring your friends and colleagues, and don’t forget to get them to sign up for InterNations first.